Did you know that your boundaries actually help your loved ones? It’s true. If you’ve ever tried to set boundaries with someone, you were probably on the receiving end of exasperated sighs, eye-rolls, complaining, pushback, or maybe even outright hostility. These types of responses — or reactions— may have caused you to think you were doing something wrong. The pushback you get when begin to practice boundaries — or when you up-level your personal and relationship boundaries skills — is often a sign that you’re not only doing something different, but that your efforts are having an impact. Your boundaries not only have the power to help you, but they also help your loved ones — including your unfaithful spouse. Isn’t it a relief to know where you stand with someone? When you’re clear in your thinking and communication, and you understand how boundaries work, you know exactly what your limits are with other people — emotionally, intellectually, physically, and sexually — and they know your limits as well. This kind of clarity reduces confusion, misunderstanding, and sometimes heartache. Although the word boundaries is a dirty word to many people, the truth is that life is simply not possible without them. When someone is boundary-less in their speech or actions, it can be uncomfortable and even painful to be in their presence. They say whatever comes to mind, and do whatever they want to do without regard to their impact on others. You can’t go anywhere or do anything without experiencing boundaries. Your clothes, your decisions about who you spend time with, how you spend your money, and where you live are all examples of the simple, yet often invisible, presence of boundaries in our day-to-day lives. When you have the clarity that comes with clear and relational boundaries, your stress level automatically decreases and so does everyone else’s. In fact, when your boundaries are solid, you’re happier. And when you’re happier, so is everyone around you! Boundaries create clarity and safety, and safety calms your nervous system. Hi I loved your boundary setting book. It was just the right time and has impacted not just me but my husband as well. He has told me with tears how much the boundaries have helped his sobriety ! Who knew! If your spouse has enough clarity — and sense — to respond rather than react to your boundaries, they will actually help him/her to improve their life. Addiction is not only an equal opportunity destroyer, it can kill. That means your boundaries can potentially save another person’s life. Let me be clear, it is not your job or responsibility to get someone sober or to save their life. However, it is absolutely true that your boundaries can have a powerful influence on another person if they make the choice to respond to the boundaries (including requests) you make. When you are altered, or our conversations are crazy-making for me, I’m not available for a conversation. I request that you complete a drug test (or polygraph) at certain intervals once a sobriety date is established. I request a “blow-and-go” be installed on your car (if you have minor children who ride in the car with your spouse). Separation in cases of chronic deception, lying, or relapses. Join Vicki Friday, January 18 for a free, live online Clarity Circle! 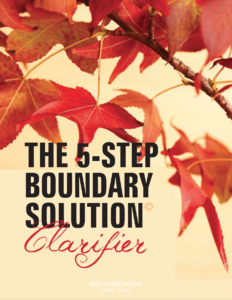 *Want to hear more about how your boundaries help those you love? Listen to the podcast episode here.